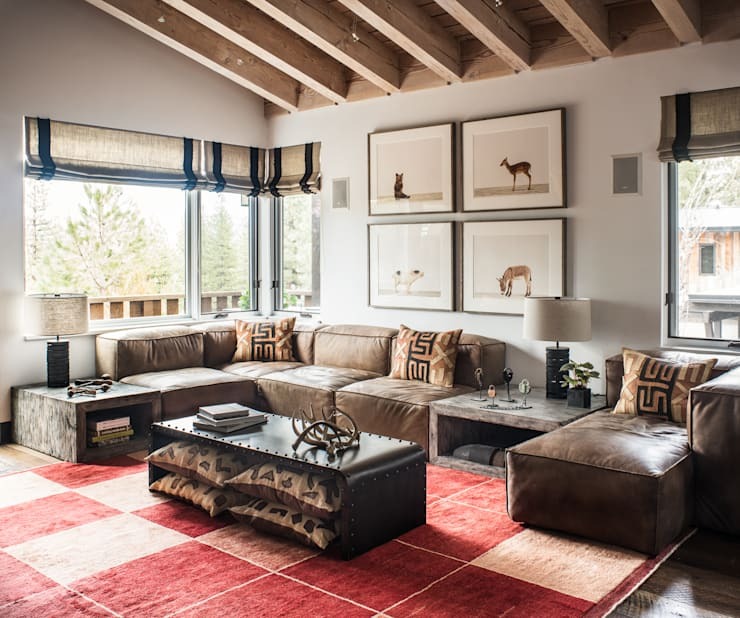 Welcome to the Truckee Residence – an Antonio Martins Interior Design ski chalet in Tahoe. This is the ultimate mountain retreat. Friends would delight at an invitation here! The interiors of the home are masculine and swanky. Design elements like reclaimed wood and faux fur give the home the feeling of being an upscale cabin. The home makes use of wall treatments that make the home dynamic and full of energy. Let’s take a look at this casual and inviting chalet home! A hall leading to the bedrooms decorated with vintage photos. These are 19th century albumen photographs from the Tahoe region. Brown hues from the photos echo the wood dresser that provides well organized storage for the room. The bright white wall and dark floor balance perfectly. 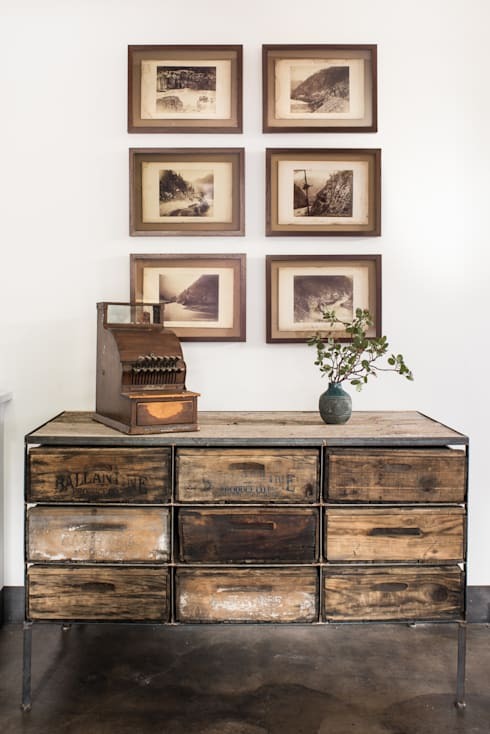 The old-school cash register is a charming touch and we love the simple dash of greenery from the bud vase. This living room is a comfortable place to relax after a long day on the slopes. There are animal accents throughout the home with antlers adorning walls and scattered about. On the far wall there are sweet and simple photographs of animals. The large leather sectional couch provides flexibility for how you want to organize your seating area. There are plenty of plush graphically designed pillows around and extras are stored under the coffee table. We love the wooden rafters! In the living room a floor to ceiling fireplace dominates the room. Firewood stacked next to the fireplace becomes part of the design and hides an entertainment centre. 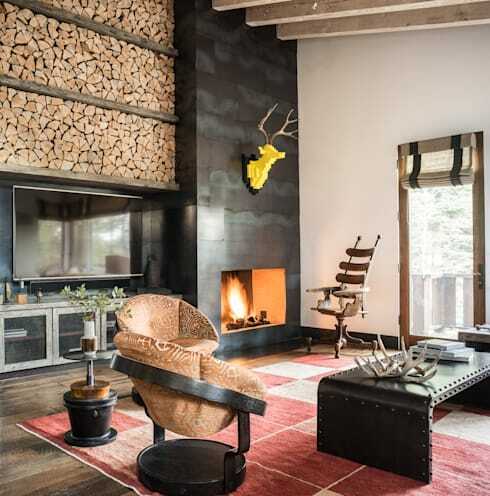 A fireplace is a focal point for any ski chalet! We love the art in this room, particularly the Pixel Deer by Jihoon Choi. It’s a fun twist on a traditional design element of cabins. A couple of 1960s swivel chairs in the room provide more vintage charm and make the room feel stylish yet casual. You can just see the rustic wooden floors beneath the comfortable area rug. 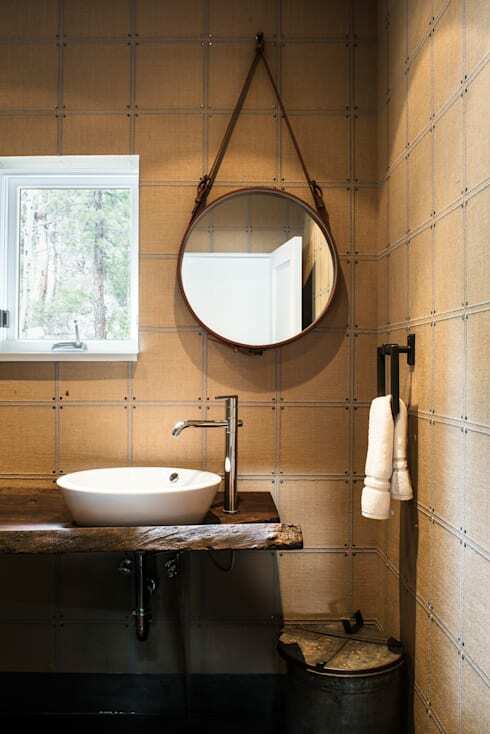 This powder room features custom wallpaper that makes the room feel very put together. We love the floating shelf counter and the round designer mirror. There is great lighting in this room that features the wallpaper and warms up the room. Simple and luxurious elements make this feel like a swanky space to refresh. 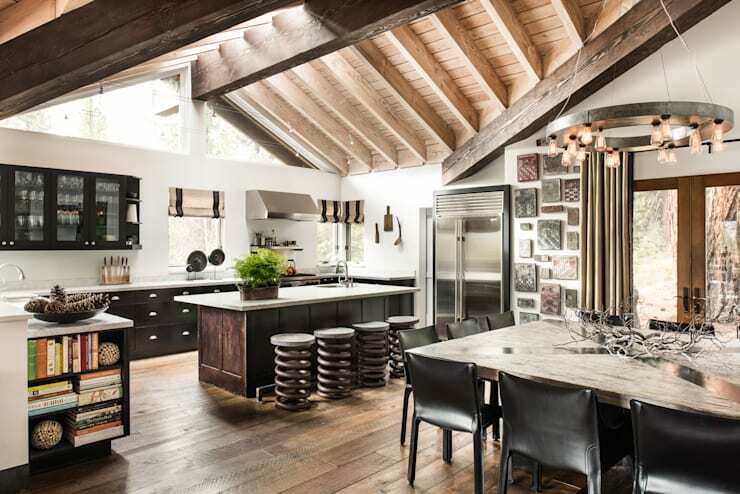 The kitchen and dining area has a high ceilings and a gabled roof. We love the high up glazing that brings lots of light into the room. The kitchen is bare and expansive with an island that provides a casual dining space with the addition of bar stools. The dining area features a 7-foot recycled wood table surrounded by armchairs. We love the neutral tones of this room and the environmentally-friendly dining table. This is a comfortable room to fuel up for a day of skiing! Let’s take a look at three of the bedrooms in the home. Each has its own style and personality. Natural design elements are to add softness to the home’s masculine design. 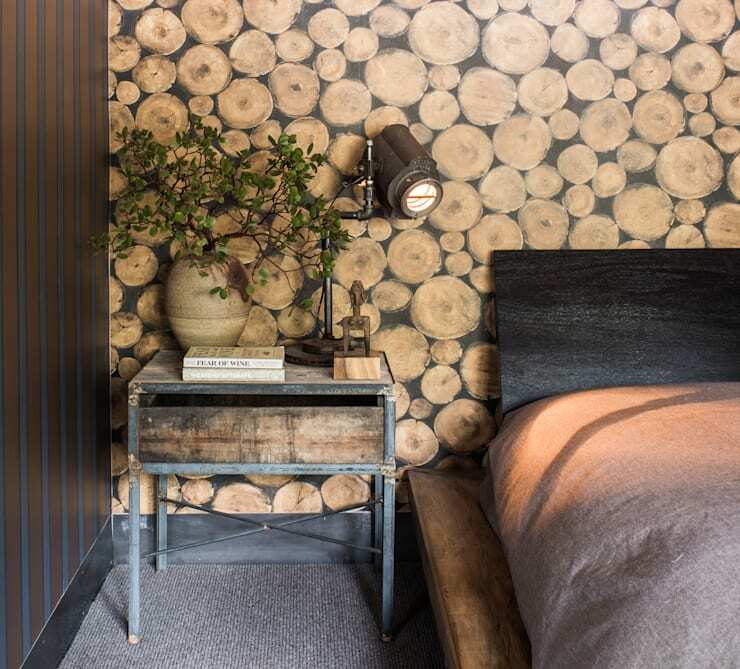 This woodsy bedroom has an incredible log wall treatment. The simple palette of black with browns makes this space a calm retreat for guests. We love that nostalgic table lamp on the bedside table. This bedroom has a modern look. 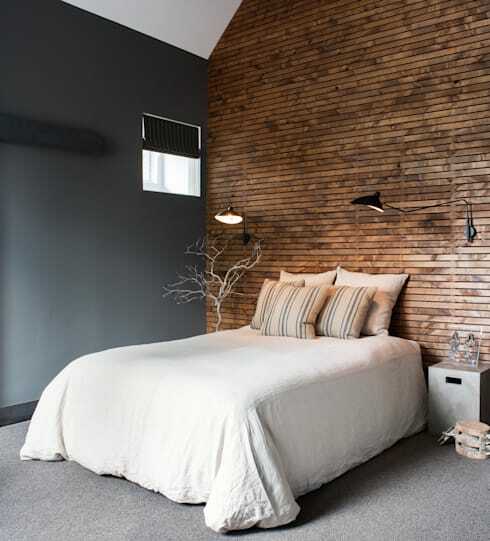 The grey wall is a sophisticated addition to a cabin style bedroom. Minimalistic style makes this room stylish and simple. There’s a small window up high on the wall to give guests privacy and natural light. We love the wall treatment in this room! The dark stain of the wood is a luxurious addition. 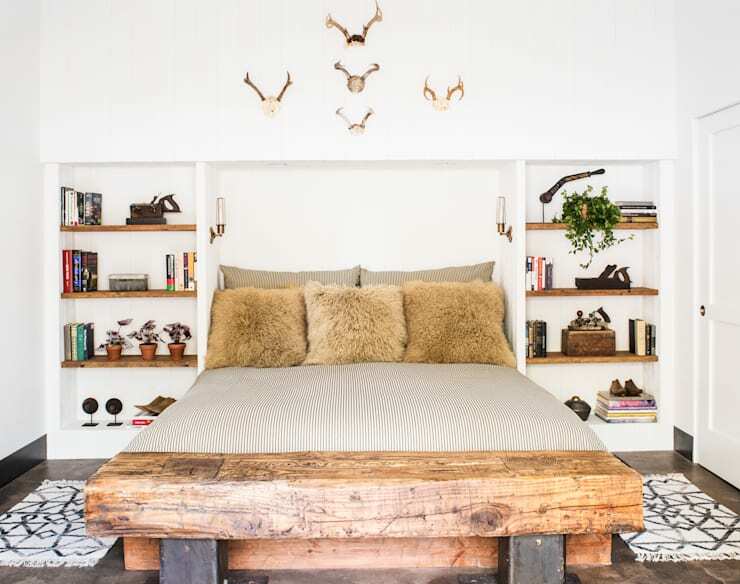 Finally we’ll take a look at this chic woodsy bedroom. The buil- in shelves provide lots of storage for books and decor items. Bright white walls make the natural accents in the room such as the rustic wood and antlers really stand out. Faux fur pillows help make this bedroom plush and cozy. Thanks for taking a tour of this modern ski chalet with us! For more cozy home inspiration, check out our feature on a straw roofed home that shines with cozy comforts.